Why can’t I stop loving him? That is one of the top questions we get from clients and readers of our blogs. When a relationship ends, at some point we are supposed to move forward and let go of the feelings we once had. The problem is, so many people have a really tough time moving forward and find themselves unable or unwilling to let go of the feelings they had for someone they are no longer in a relationship with. 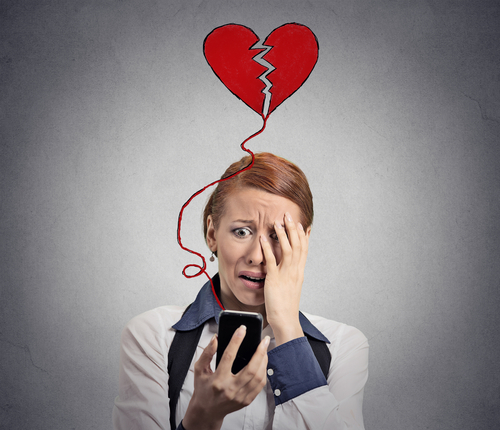 When relationships come to an end, it is most common that one partner has already moved on emotionally, while the other didn’t see it coming and is still fully emotionally invested in the relationship. It is hard to see someone we love move on and show us, and the world, thanks to things like social media, that they no longer care about us. It breaks our hearts, and we can suffer immeasurably when this happens. Realistically, falling in love takes time, and so does falling out of love. It may seem as though your partner fell out of love with you suddenly, but that is really not the case. They may have hidden the process from you extremely well for a long period of time, or truly were not as in love with you on the inside as they were portraying on the outside. Don’t judge yourself too critically for being blindsided. Some people are really great at hiding their feelings, and it does not make you stupid for not seeing what they tried so hard to conceal. Why Can’t I Stop Loving Him? If they were having an affair and you didn’t know, it doesn’t make you foolish, it speaks more about how good your ex partner was at being deceitful. Remember, you should not try to compete with how quickly they stopped loving you and how quickly they moved on and found happiness without you. They had a head start, so stop trying to catch up. Work on yourself, and give yourself the time you need to get to the place that they are. It is hard to stop loving them, regardless of how the relationship ended. You had history together and good times together. You cannot just shut your feelings on and off like a light switch, even though it appears as if they have. When you truly care about someone, you have to grieve the loss at a rate of time that is right for you individually. Don’t let your friends and family, although they may mean well, pressure you into moving on too quickly. But don’t prolong your misery by doing all the wrong things that will keep you stuck. Take steps necessary to heal your broken heart. Don’t live your life through them. Don’t try to find out every tidbit of information you can about how they are doing. Don’t rub salt into your wounds by searching for their “look how happy I am” photos on social media. Don’t make excuses to see them or contact them. Don’t keep telling yourself you are unloveable, unworthy, or that you will never be happy again. Don’t hold on to false hope that somehow, someday, you will get back together. Live for today, not pine for your past. You can love a person and still live without them. You have to accept, at some point, that they are no longer a part of your life and that you have no control over that. What you do have control over is what you make of today. Find a way to add something to your everyday routine that brings you some joy, and some feeling of purpose. If you made the mistake of allowing yourself to revolve your life around one person, learn from that mistake and don’t repeat it. We can love those that we have moved on from and not have it keep us from loving someone in the future.